Portland, OR. The number of bridges involved in the Providence Bridge Pedal on August 12th will be limited as a portion of the Springwater Corridor is closed for four months of construction. The routes offered used to include the St. Johns Bridge and the Sellwood Bridge, but this year the longest ride for cycling enthusiasts has been reduced from what was once 36 miles down to 18. Organizers say the heart of the Providence Bridge Pedal remains intact. All cyclists will cross the upper decks of both the Marquam and Fremont bridges, with the exception of Kids Pedal participants. It’s the one opportunity each year to bike or walk on Portland’s car-free streets and bridges. Along with Montreal’s Tour de l’Île, New York’s Five Boro Bike Tour and Chicago’s Bike the Drive, Portland’s Providence Bridge Pedal is one of the largest community bike rides in the world. On the second Sunday of August each year about 18,000 cyclists bike a combined 400,000 miles through the car-free streets of Portland. There are attractions along the way, like Portland Takohachi’s high energy Japanese drummers on the Marquam Bridge. Portland Takohachi’s high energy traditional Japanese drumming lifts spirits on the Marquam Bridge. The Burnside Bridge offers a view of the “Portland Oregon” sign. Bicyclists stop on the top deck of the Fremont bridge to listen to the cellists. Rick Bauman, who founded the ride in 1996, is pleased with the way it has evolved. In its first year, there were 7,500 riders; recently 18,000 took to the road. A portion of the Providence Bridge Pedal proceeds supports community programs and initiatives that improve the health of our community. “The Beat Goes On” marching band has been a big hit with riders as they crossed the finish line. Our Portland Society Page team has hit the road in years past to take photos. We want the Providence Bridge Pedal experience to be available to as many people as possible. So we are rolling back the registration fee to 2003 levels. There are no longer age and group rates. Each ride has just one rate for all participants. Marquam Express – Enjoy sunrise and a light breakfast on top of the Marquam Bridge with stunning views of downtown Portland, the Willamette River and the Cascades. Then bike on I-405 to the Fremont Bridge and onto the rest of the Providence Bridge Pedal route. Main Ride – This new configuration crosses six downtown bridges with a thrilling ride on I-405 from the Marquam to the Fremont Bridge. Riders may do multiple loops. Kids Pedal- Even the youngest cyclists can enjoy being part of Providence Bridge Pedal with this three-mile loop crossing the Hawthorne and Steel bridges. Adults are welcome too as long as they are chaperoned by a child under 13 years of age. Although this is a free event, registration is required. Kids Pedal is the one Providence Bridge Pedal event with a registration limit so sign up early. 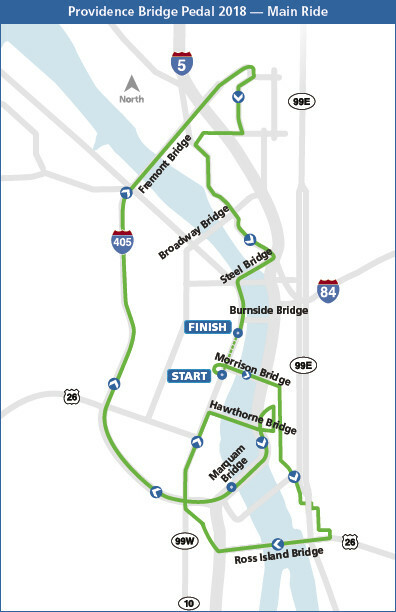 Bridge Stride – The Providence Bridge Stride route for 2018 is five miles long and crosses the Fremont and Steel bridges.